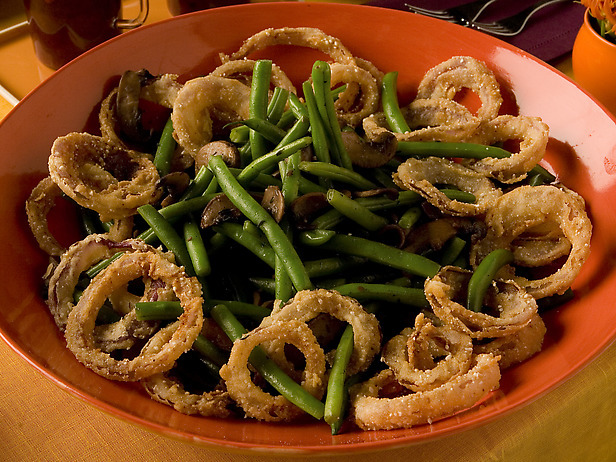 I’m not a big fan of the traditional green bean casserole because its just way too simple. It actually tastes pretty damn good but I have to work a little harder than that right? Here’s a recipe that I love to cook every year. Its from Tyler Florence on the Food Network. He has some great recipes overall although you usually need to do a bit of shopping since he works with some very specific ingredients. Bring a large pot of water to a boil; add a big pinch of salt and the green beans. Cook for about 5 minutes, the beans should still be crisp, they will be cooked more in the oven. Drain them and set aside. Butter a baking dish large enough to hold the green beans with 1 tablespoon butter and set aside. Tear the bread into 2-inch pieces, put them into a bowl, and add 1 tablespoon chives, 1 tablespoon thyme, 1 tablespoon rosemary, 2 tablespoons Parmesan, and 3 tablespoons olive oil. Stir well to coat and spread onto a baking sheet. Bake just until the bread just starts to turn golden, about 10 minutes. Remove from the oven and set aside. 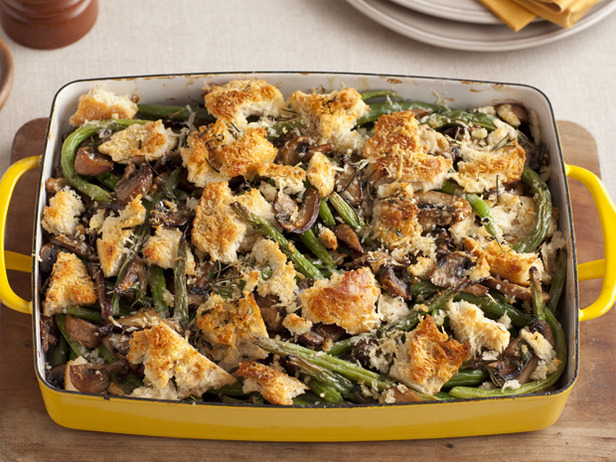 Here’s another recipe for green bean casserole done by Micheal Chiarello (Top chef masters). He’s also one of my favorite chefs and I definitely enjoy making his creations here and there.